Retail food stores represent the confluence of individual choices and the policy decisions we have made collectively about our food systems, in a physical environment. They are full of food, spaces, information, and people making transactions. Everyone eats—and nearly everyone shops to eat. Where, how, and why we buy food, as well as what we buy and eat, has a big influence on our health. My research on healthy retailing uses strategies from management and nutrition science. We do observational research, small and large intervention studies, and gather stories. Our aim is to learn about the best ways to make buying food a healthy and rewarding experience--for eaters and retailers. We work with businesses, planners, public health practitioners, nongovernmental organizations, community members, and municipal leaders to advance retail solutions that work best for local environments and contexts. This evidence will be used to inform broader policies to make retail food environments healthy places for all, especially for underserved urban neighbourhoods and rural/remote communities that rely on small food stores. Healthy retailing is about more than nutrition: it is about the life, survival, and resilience of communities. It is about innovation that happens every day. It is the ongoing invention and reinvention of places, social and economic relationships, and policies to promote health in communities worldwide. Funded by: Health Canada Office of Nutrition Policy and Promotion; Canadian Institutes of Health Research; Leslie Harris Centre for Regional Policy and Development; Social Sciences and Humanities Research Council; Australian National Health and Medical Research Council. Resource distribution affects health. When households have inadequate income to access food, it represents a serious level of material deprivation. This a striking measure of inequity in our societies. Experiencing food insecurity means people are predisposed to poorer mental and physical health. This has an effect on all of us: it diminishes what we can achieve collectively and raises health care costs. My research as an investigator with the PROOF research program at the University of Toronto looks at promising policy options to address food insecurity and how we can advance them as political realities. Funded by: Canadian Institutes of Health Research. Diet-related causes are the leading driver of the global burden of disease. Yet food is also one of the most interesting tools we have to bring people together for analysis, dialogue, and engagement. Through intersectoral workshops, capacity building with practitioners and trainees, and as a local and global citizen, I promote information sharing, transparent public processes, and encourage rigorous evidence-informed debate on the food and health issues that matter most to communities. I am a former member of the Toronto Food Policy Council and a founding member of the St. John's Food Policy Council. Funded by: Leslie Harris Centre for Regional Policy and Development; Office of Public Engagement at Memorial University; knowledge exchange funds from research grants. Policy innovation in city-regions, why great small businesses are important for healthy cities and communities, the health effects of buying food in stores and restaurants, and uncommon policy alliances. 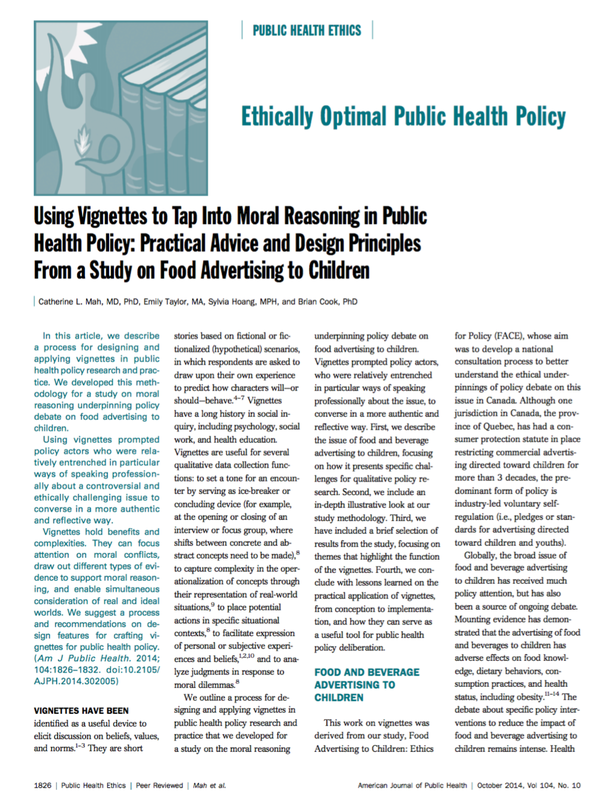 Evidence informed policymaking, when a good policy option is only as good as its framing, policy stories, policy rhetoric, moral justifications for public health policy, and the power of persuasion.